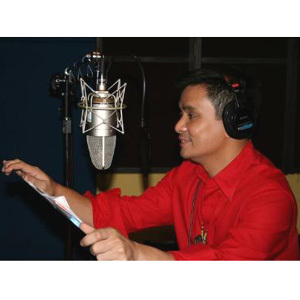 GMA-7 artists support "Isang Kinabukasan Benefit Album"
Ogie Alcasid is one of the 54 GMA-7 artists that supported the creation of the album Isang Kinabukasan. This 12-track album won the Best Secular Album and Best Music Video in the recently-concluded Catholic Mass Media Awards. The Isang Kinabukasan Benefit Album is a revenue-raising endeavor to fund the projects of the GMA Kapuso Foundation. Fifty-four Kapuso stars shared their time and effort for this endeavor that has won Best Secular Album and Best Music Video in the recently-concluded Catholic Mass Media Awards. All proceeds will help the Kapuso Foundation spread the happiness of the season. Featuring the recording industry's top performers and hitmakers, the album has 12 cuts including the carrier single, "Isang Kinabukasan" composed by Wency Cornejo. The album also comes with a video CD which includes a music video of the carrier single that was directed by Louie Ignacio. In this music video, viewers will see Regine Velasquez, Pinoy Pop Superstar winners & runner-ups, Pop Star Kids, Joey de Leon, Allan K, Jaya, Ogie Alcasid, Janno Gibbs, Gian Magdangal, Kyla, Jay-R, Jolina Magdangal, Yasmien Kurdi, Dingdong Dantes, Jennylyn Mercado, and Dennis Trillo, among others, performing for the benefit of under-privileged Filipinos. Grab your copy of the Kapuso Foundation's Isang Kinabukasan album and help support the cause. Original copies of the album are now available in all SM, Odyssey, Astroplus and Astrovision outlets.